During the 39th World Scout Conference, a workshop on volunteering took place. 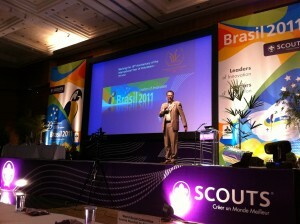 Wayne Bulpitt, UK Chief Commissioner for The Scout Association provided information on what they were doing. He explained how efforts were being made to promote employer supported volunteering not just from the perspective of corporate social responsibility but also from a human resources policy angle. Benefits to businesses and organisations were being communicated as reduced absenteeism, transferable training etc. Wayne went on to explain how a significant number of the Chief Executives from the United Kingdom’s top 250 companies were Scouts and efforts were being made to identify ambassadors in the private sector who could help to champion employer supported volunteering. He provided an example of how one employer, the Government, was supporting Scouting by giving employees time off, for up to 3 days, for residential experiences with their Scout Groups. Whilst this was positive, there is still no uniformity in the application of this recognition benefit, and further work is being done to try and harmonise it. Marco van der Ree, from UN Volunteers provided an overview of the background to the International Year of Volunteering in 2001 and how the 10th anniversary in 2011 was being promoted. He also noted that there was a positive overlap with the European Year of Volunteering. There are five major Regional IYV+10 meetings taking place during 2011, to strengthen partnerships and create national and regional ownership of the year. There will be a Summit on volunteerism and Millennium Development Goals in Kenya in June 2011. There will be a strong focus on volunteerism during UN Days throughout the year. The 64th UN DPI-NGO Conference will take place in Bonn, Germany, in September 2011. Around the date of International Volunteer Day, General Assembly Meetings will address volunteering in December 2011. At the same time, it is envisaged that there will be a launch of the ‘State of the World Volunteerism Report’ itself on 5 December 2011. To raise awareness of volunteering, an exhibition will be staged at UN Headquarters on the theme ‘Volunteers of the World’. This will run throughout December 2011. The National Commissioner for Adult Training and Development, Paul Parkinson, provided an interesting overview of the Scouts Australia Institute of Training and their eLearning platform. The Scouts Australia Institute of Training (SAIT) coordinates the training and development of Adult Leaders in all states and territories in Australia. The training system includes preliminary, basic, advanced and supplementary training in Scouting and the skills required to develop and lead young people, as well as integration assistance and support for the duration of the Leader’s appointment. SAIT was launched in 2004 as a nationally accredited training organisation. SAIT currently offers courses from Certificate II to Diploma level in Leadership, which are recognised outside Scouts Australia and are transferable to other areas of education and business. Each year Scouts Australia delivers more than 1,200 training programs to 10,000 Leaders and Members nationwide. The SAIT provides support and accreditation to each of Scouts Australia’s State Branches to ensure effective delivery of the training program. The SAIT Office is a base for resource materials and training apparatus, and an Administration Officer provides regular contact with each Branch and responds to general inquiries and requests for current training materials and support. A Training Officer works to assist in the development of materials and to confirm the accountability requirements associated with the national accreditation process. The National Commissioner for Adult Training and Development is a volunteer position responsible for the development and updating of curriculum and support materials to meet all the training needs of Leaders and some aspects of the youth program. This includes the Leader of Youth, Leader of Adults and Adventurous Activity components. The National Commissioner for Adult Training and Development works closely with the Branch Commissioners for Adult Training and Development in each State and Territory regarding the delivery of the training programs. SAIT is launching an eLearning platform to assist with Recognition of Prior Learning (RPL) and to provide more immediate access to training records etc. Paul explained how the programme was being rolled out and how important it was to stress that eLearning doesn’t mean the watering down of training provision. We will try to obtain the PowerPoint presentations used by the three speakers and place them online for download, so check back soon. Good briefing, Craig, thnaks for this!